In early Summer I have asked myself, whether Zydrine will drop even further in price or not. By purely looking at it's price chart a few months ago, not only a few traders though: "Wow, Zydrine has fallen a big deal during the last month. Guess I should stockpile now :-)" I had a bad feeling about it and started an attempt to understand all bigger mineral price changes during the last year by connecting them to incidents in the Eve Universe and using some commonsense. Possibly, the conclusion that Zydrine will continue to go down the tube for quite a while saved me lot of ISK by NOT having stockpiled it a few months ago. Here we go. After listing important incidents in Eve, I'll have a look at all minerals. If you think there are other events or conclusions, that I've missed, please state your ideas. Tritanium: CCP's War on Bots was especially successful against High-Sec-Bots. This led to a significant shortage of Low End minerals during spring 2011. Some people think, that the new equilibrium after a successful ban of most bots will be higher than the stable price between March and June 2011. It can be argued, that shortage and thus higher price of Megacyte (Fall of the Northern Coalition) between May and July 2011 had a downward pressure on Low-End minerals. When the conflict in the north of New Eden came to an end, Tritanium started rising again. Not significantly, though (summer slump). Isogen: Not much to say. In contrast to Nocxium it was NOT affected by CCP having changed alloy composition and it was NOT important for Noctis production. The spike in April was possibly because of CCP's War on Bots. As Tritanium is the Low-End bottleneck and Megacyte the High-End bottleneck, the speculative rise between February and April 2011 vanished by may. Further falling until begin of July was possibly induced by shortage of High-End Megacyte (Northern Coalition War, that ended on July 3rd), which weakened prices of Lower and Middle class minerals. Nocxium: I love to look at this mineral, as it's longterm changes in price are closely connected to changes in Eve Universe. In autumn 2010, CCP's change of the loot table from drones and the new composition of alloys led to a Nocxium shortage. As there was much discussion about this in the forefront (how to make lowsec - what is where Nocxium can be mined best - more appealing to miners by shortening sources of Noxcium outside of lowsec), more than a few speculators earned a ton of ISK by stockpiling Noxcium beforehand. With a price of slightly above 300 ISK, Nocxium had found it's new equilibrium in November 2010. The next price shock of Noxcium came with the introduction of the Noctis - the first salvager class ship - with Noxcium as a leading composition in producing it. As there have been thousands of pilots who were eager to get hand on this nice ship as fast as possible, Nocxium skyrocketed in a few days. At that time, it was sensible to expect the new equilibrium of it - after the Noctis Hype - to be a bit higher than the first one. Since late summer, it's value has leveled off near 400 ISK. The big 'Noctis Mountain' at the price curve between Christmas 2010 and July 2011 was overlayed by a small spike during April 2011. This had nothing to do with the Noctis Hype. It was a spike characteristic to the Mid-End minerals Nocxium and Isogen. As Isogen was not effected by the Noctis production, it shows this spike very clear. Zydrine: The trend of prices for Zydrine is closely connected to Megacyte prices. Taking only the Hing-End minerals Zydrine and Megacyte into account, Megacyte is the bottleneck. This means, miners try to mine Megacyte heavy ores if possible (Bistot instead of Arkonor). As the early summer invasion into Northern Coalition Territory shortened the supply of High-End minerals, one could have expected Megacyte AND Zydrine to rise in price. But only Megacyte became more expensive. My assumption was, that if Megacyte will drop in price after the Northern Coalition War, it's Minion Zydrine will fall too even further. And it did. Shortage of Tritanium: In relation to each other, rising Tritanium prices (Low-End) lead to falling Megacyte prices (High-End). This can be observed during spring 2011, where CCP's War on Bots hit Empire Bots more severe than Null-Sec Bots. Higher Tritanium prices induced a lower overall production, thus less demand for Megacyte. Shortage of Megacyte: As Megacyte can't be mined in Empire space (of course it can be loot-refined there, though) it is more sensible to Null-Sec activities than Low-End minerals. During the Invasion of the Northern Coalition by Drone Russian Forces, many Null-Sec miners stopped their mining operations. This explains the rising price of Megacyte in summer 2011. Peace: Now, that mining activities are going back to normal in the former NC Territory, supply of Megacyte should rise again. Keep in mind that speculations and anticipation of events play often a role in our Eve Universe. Even on a one-year timescale. There is also a bunch of other events from Tournaments over Hulkageddon to civil riots in the wake of the Introduction of Incarna, that may be important. Personally, I like to give price curves some meaning. To the extent that I prefer a wrong theory to no theory at all. Good post. 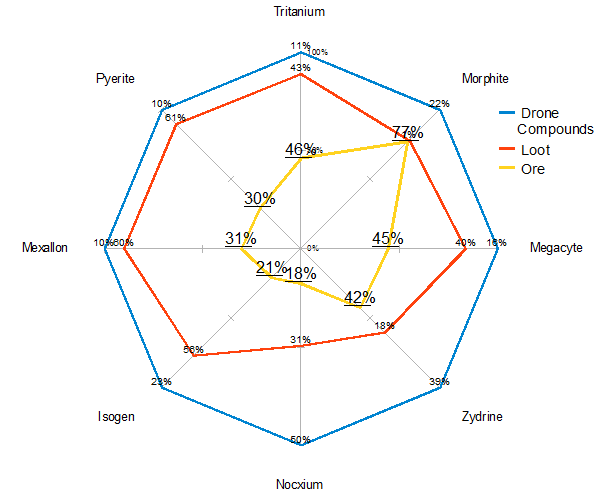 It's interesting that the minerals that show low proportions coming from loot on your composition chart have done well over the last year and the minerals that loot provides a lot of have done poorly. That may mean that the single most important factor in the minerals market over the last year has been the introduction of the Noctis. However the mission drop nerf came before the introduction of the noctis if i recall right.So even with the noctis the amount of modules that get reprocced are a LOT lower then before i think. yarr, mission loot nerf was before noctis. Another point which arguably caused a bubble (though perhaps indistinguishable from noctis bubble) was the SP refund of learning skills - this resulted in a large number of people suddenly having a mill+ skill points which they could sink into flying a carrier or some other similarly sparkly guff. I had a bet last year, thread is someplace, about mineral prices affected by that perfect storm of mission loot nerf, noctis production eating all that nocxium, and SP refunders wanting new ships.